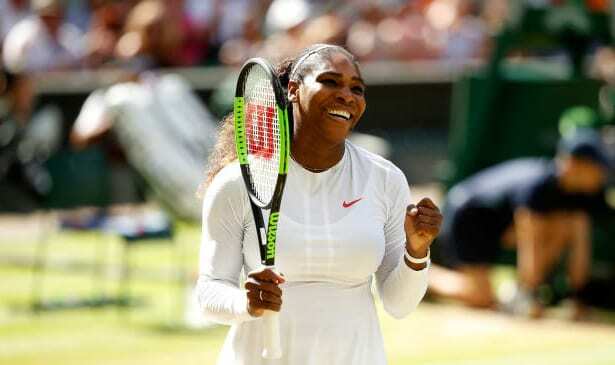 Serena Williams finally dropped a set at Wimbledon Wednesday, but then reasserted her dominance and reached the Wimbledon semifinals with a 3-6, 6-3, 6-4 victory over Italy’s Camila Giorgi. Williams came into the event ranked 163 in the world due to her absence from the tour on maternity leave. But she had moved through the opening four rounds without dropping a set, and with seeded players falling left and right, definitely seems the favorite for an eighth Wimbledon crown. But she began slowly in Wednesday’s quarterfinal, her powerful serve erratic, and Giorgi’s counter-attack philosophy seeming to work. Then Williams turned things up a notch, and began playing like the longtime number one player she’s previously been. When things were over, she had reached the semifinals for the 11th time. Williams faced number 13 seed Julia Goerges of Germany in her next match Thursday. Goerges defeated number 20 seed Kiki Bertens of the Netherlands 3-6, 7-5, 6-1.